The prompt Avery picked for this story is “Get on with it.” What you are about to read is the second installment of Bad Blood. If you recall from last time, we learned that Victor (a vampire) had been arrested for killing several sorority girls. Judd is mortified and not sure what to make of the news, given the awesome time he had with Victor. Chapter 2 gives us insight into Victor’s current situation. Victor paced the confines of his small cell. The Paranormal Police Force had quickly discovered they couldn’t house vampires in human jails without retrofitting them for beings that had superior strength and senses. Giving into his frustration, Victor lashed out at the cement wall, which did nothing more than break some bones in his hand and scrape his knuckles. Before long, though, they would be back to normal. He cursed at the camera mounted in the far corner of the room before flipping off whoever kept watch over him. The bastards had turned the multitude of lights up to their highest setting, which caused a throbbing sensation behind his eyes. He turned his back to the camera before massaging his temples. Victor didn’t want to give the arrogant Detective Finan the satisfaction of knowing his tactics caused Victor distress. Although, the squirrely detective was probably hard at work – practicing his creative writing skills as he prepared the charges against Victor. Cause there’s no way he can have proof I killed those girls! 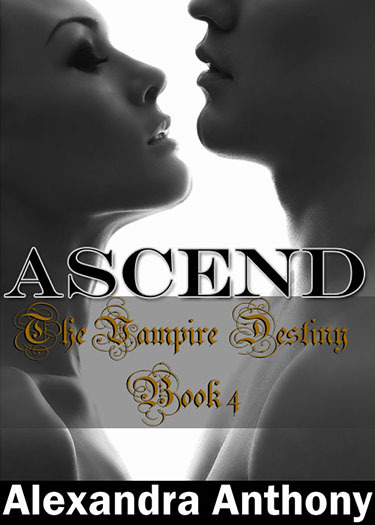 Ascend: The Vampire Destiny Series Book 4 by Alexandra Anthony was published on June 1st, 2013. Josephine and Stefan head back to her childhood home to search for the lost journal her uncle kept – a journal that may unlock Stefan and Josephine’s shared past. While searching, Josephine’s world is once again turned on its axis when she meets Liev Banin, who reveals a long-kept secret that will change everything for Josephine….and her family. Still reeling from their discovery, they are rocked to their very core when a trusted friend betrays them…and threatens to destroy them all.